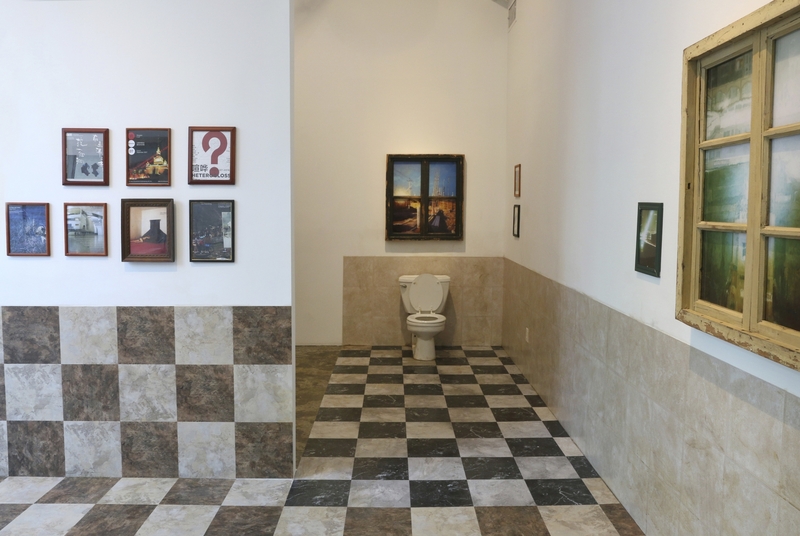 Exhibition view of Adrift at Chambers Fine Art, New York. Cao Yi, Window No. 5, 2016. Acrylic on paper, 107 x 78.5 cm. Courtesy of the artist and Chambers Fine Art. 33 9/10 × 30 7/10 × 2 3/5 in, 86 × 78 × 6.5 cm. Courtesy of the artist and Chambers Fine Art. Yi Xin Tong, Immortal Caverns: New Peacock Pavilion I, 2015. Archival pigment print, 38 x 53 cm (15 x 21 in). Anyone who has visited China over the past ten years can testify to the rapid changes taking place in this country’s urban environment. Whole neighborhoods have disappeared, hutongs replaced by shopping malls and superhighways. While Chinese artists have been commenting on this extreme case of urbanization for the past twenty years, more recently millennial artists have joined the conversation. For them, little of the past remains and instead of nostalgia for what has been lost, they have grown up with the acceptance of constant change. From this condition, they are making works that reflect China’s new landscape, incisively documenting the terrain while attempting to experiment with a wide range of aesthetic choices. In this thoughtful exhibition, Chambers Fine Art presents the work of four young artists who, one way or another, mirror the changes in Chinese cities. Three of the artists–Cao Yi, Li Qing and Zhao Zhao–contribute paintings, though they diverge in their creative approaches. The final artist–Yi Xin Tong–presents a photo essay that goes further than his peers in capturing the true surrealism caused by China’s record-breaking transformation, indicating that photography, rather than painting, may be better suited to the task of documenting with this bizarre evolution. Zhao Zhao is perhaps the best known of this quartet, having first begun to exhibit work after a stint of serving as Ai Weiwei’s videographer. In this exhibition, he takes his inspiration from a flood in Beijing in 2012 during which he floated on an inflatable mattress through the streets of his local Caochangdi. In the video, Flood, he is seen in repose, being swept along the village streets by a muddy stream of water. 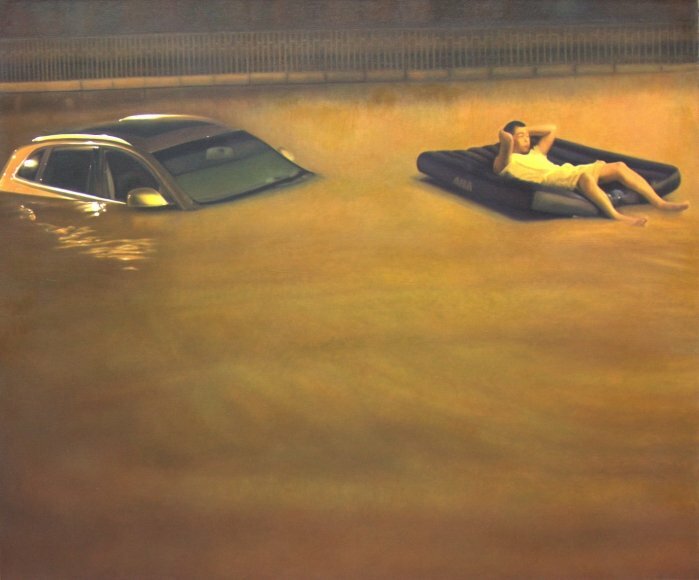 In Rain, a canvas from 2012, he depicts himself again on the mattress, buoyed by the flood beside a car that is almost totally submerged. The two works depict the eerie juxtaposition of man vs. nature, where natural disaster overwhelms the urban environment. 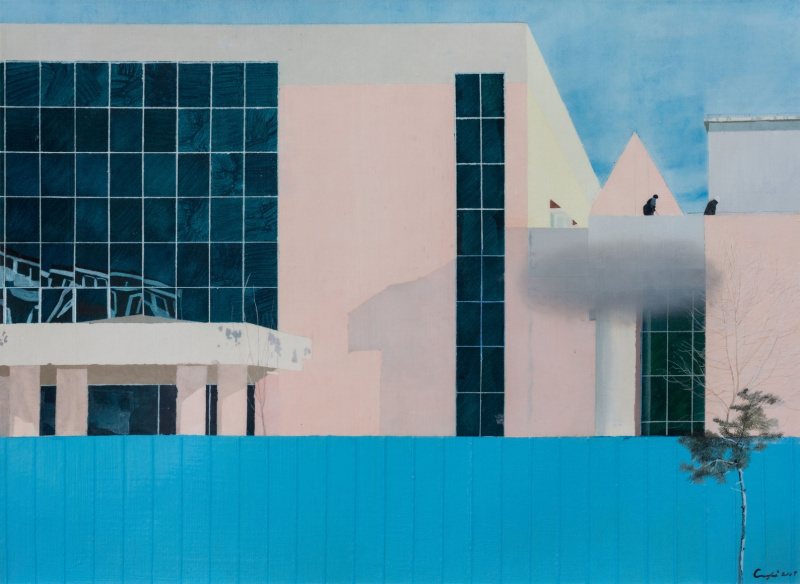 Cao Yi, on the other hand, captures a most unnatural view with his painting, Home, 2014-15, in which we see a rundown housing project peeking out from above a decrepit white wall. Here, the artist presents the reality of urbanization where buildings erected not too long ago already seem like ancient ruins. In Window No. 5, 2016, a modern edifice which could be a museum or an industrial plant towers over a blue fence. Again, indications of deterioration are already visible on the facade of the structure. Li Qing, who lives and works in Hangzhou, takes aim at the contemporary art world and the way it has impacted development, especially the museum boom in Shanghai. 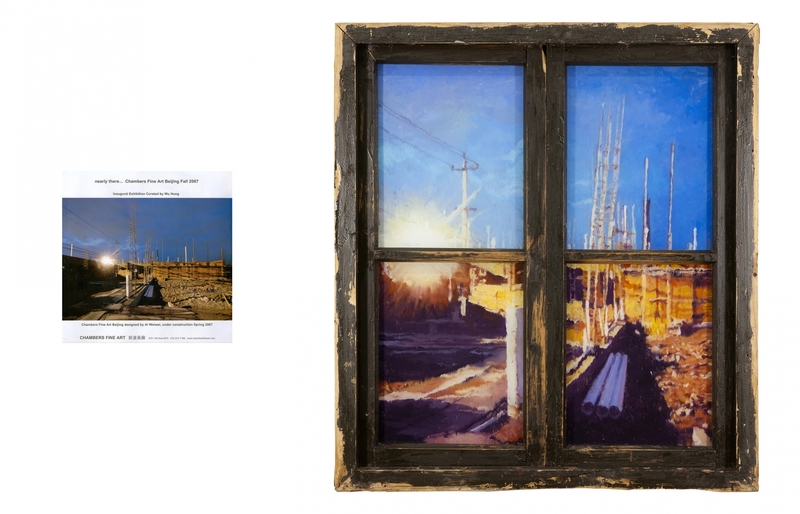 Using discarded windows as frames for his paintings, this artist takes his initial inspiration from advertisements in Artforum, blowing up details from the pictures into full scale landscapes. For example in Blow-Up–Candle Houses, 2014, Li Qing started with an ad for a Chen Zhen exhibition at Galerie Perrotin, then rendered the colorful composition of the late artist’s installation as if it was a street of houses, seen through an old fashioned window frame. Or in Blow-Up–Caochangdi, 2014, Li Qing takes an ad for Chambers Fine Art in Beijing which shows the gallery under construction in Caochangdi. The resulting painting of the construction site seems particularly well suited to appear to be a view from a window. These painters display exemplary skill and creativity though the resulting art works seem too quiet to truly convey the violence of the upheavals that have taken place in recent years. Yi Xin Tong, on the other hand, comes close to communicating the wild, bizarre, lunacy of urbanization with his 2015 series of photographs, Immortal Caverns, taken in a former zoo in Lu Shan National Park, now a World Heritage site. Though the zoo closed years ago, it is still very much in use as housing for migrants and other homeless people in the region. Here, Yi Xin Tong photographs the Red Panda Pavilion, filled with possessions of an absentee tenant who now lives where wild life once was caged. In Immortal Caverns: New Peacock Pavilion, one lonely bird remains while the fabulous structure in which it stands provides shelter for an elderly woman. 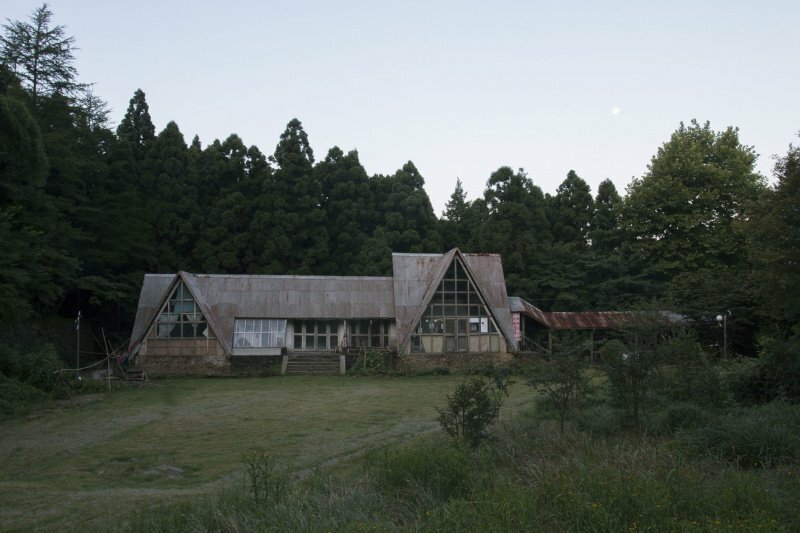 The solitary lady is seen gracefully rounding up her flock of chickens in a silent video that juxtaposes the mansion-like structure built for birds and the rudimentary life now contained therein. These four artists certainly have much to say that is worth paying attention to and bringing them together makes for a savvy exhibition. Taken as a whole, they seem to be in conversation with each other, responding to similar questions from a variety of viewpoints. Barbara Pollack has written on contemporary art for such publications as The New York Times, the Village Voice, Art in America, Vanity Fair and of course, Artnews, among many others since 1994. She is the author of the book, The Wild, Wild East: An American Art Critic’s Adventures in China and has written dozens of catalogue essays for a wide range of international artists. In addition to writing, Pollack is an independent curator who organized the exhibition, We Chat: A Dialogue in Contemporary Chinese Art, currently at Asia Society Texas and she is a professor at the School of Visual Arts in New York. She has been awarded two grants from the Asian Cultural Council as well as receiving the prestigious Creative Capital/Andy Warhol Foundation Arts Writer Grant.